Aer Lingus, the Irish airline, was founded on April 15th 1936. 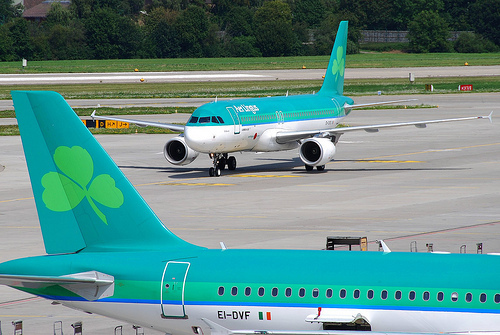 The name ‘Aer Lingus Éireann’ was proposed by Richard F O’Connor of Clydaville, Mallow, Co. Cork. He was an aviation enthusiast and Cork County Engineer (Surveyor). He promoted the idea of establishing a national airline as had already happened in all other European Countries with the exception at the time, it is said, of Ireland and Bulgaria. This was despite the fact that the first non-stop transatlantic flight from America by Alcock and Browne had landed near Clifden in 1919 and the first non-stop flight to America had taken off from Baldonnel near Dublin in 1928. The new airline was registered on May 22nd 1936 and five days later made its first flight from Dublin to Bristol. Over the following years Aer Lingus expanded its services with flights to London, Liverpool and the Isle of Man. The outbreak of World War II interrupted the development of the airline. However after the war and with the advent of better aircraft the airline resumed flights to destinations in England. As time went on Aer Lingus began flying to continental Europe with flights to Brussels and Amsterdam. The Aer Lingus transatlantic service was inaugurated with a flight to New York in April 1958. Two years later the first Aer Lingus jet propelled aircraft entered service on the Dublin to New York route. Today, Aer Lingus with a fleet of modern aircraft carries millions of passengers annually to Ireland, the United Kingdom, Continental Europe and the USA. The airline has made a huge contribution to Irish life. Throughout its history it has provided access to destinations abroad for the people of Ireland. It has played a large part in the development of tourism and trade in Ireland. 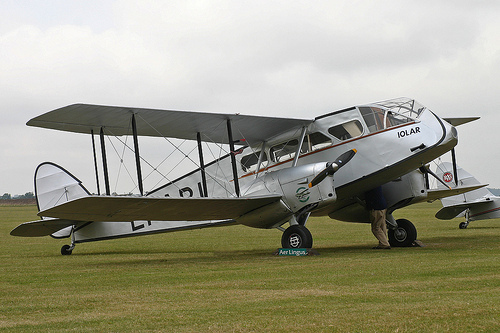 The first aircraft used by Aer Lingus was a six-seater De Havilland Dragon which was named ‘Iolar’ (Irish for Eagle). Aer Lingus made its maiden flight across the Irish Sea when it carried five passengers from Baldonnel Aerodrome in Dublin to Bristol (Whitchurch airfield) in England in the ‘Iolar’ on May 27th 1936. The first Aer Lingus jet aircraft, the Boeing 707 ‘St. Patrick’ makes its inaugural flight from Dublin to New York in the year 1960 On This Day. Yep. The equivalent of €1000 (index linked) to fly from Dublin to London return (1 hour flight), when they were part of a cartel, during a period long after the Stone Age. Proud moment in Irish history. Just as well I learned how to swim back then. Famously at the time, they made the Irish Sea the most expensive stretch of water in the aviation world. Great lads & lassies. It is a time well, if not fondly, remembered. Slow boat was the only way for most! Perhaps. However it was the likes of them who brazenly engineered the Rip Off culture in Ireland, while claiming to be morally superior. Semi States were set up supposedly on the basis of protecting the citizens against exploitation not to exploit people, which at €1k I can safely call it exploitation. The health service, for example, should be more about the sick & dying than it is. I appreciate the dead don’t have the vote, so you won’t hear any populist politician standing up for them.